Visual Studio 2012 introduced first introduced us to the “Test Explorer” that we all use today. I remember the feedback at the time as some were quite upset about missing their old “Test Results” window from VS2010 and older versions. 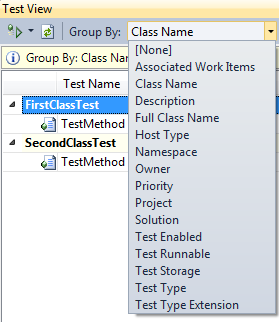 At the surface level there was definitely less options for grouping your tests in the new Test Explorer, but it was too tightly integrated with mstest. 1. You need to right-click and select “Group By” from the context menu to achieve some of the standard grouping options (its surprising how many people are not aware of these default groups). 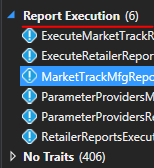 In this scenario, if I now group my tests by “Traits” I will receive all my tests bucketed into “Report Execution” (or whatever custom names you have applied) and “No Traits” for those I do not markup. You can also utilize the “TestProperty” attribute to apply traits, and values associated with Traits. You can even apply multiple traits to a test method. This will force the test to show twice under each group (but actually only run once from what I understand). You can also take a look at ReSharper, which offers much more functionality in sorting, grouping and running tests inside Visual Studio.